I was driving home one evening last winter on the east side of Markt Platz. To my left, I saw little shadows with shiny eyes were peeking out from the storm drain next to Adams street public restrooms. I slowed the car to make sure of what I saw. And sure enough, there were three kitten faces were peering out of the storm drain looking hungry and wondering where mamma was. Well, I immediately knew leaving the little guys running loose along one of the busiest 4-lanes of traffic in Fredericksburg Texas was not going to end well for them. Almost without thinking, I reached for my phone and called my longtime fellow cat trapper friend, Bonnie to help me. We have trapped thousands of community cats together over the years. We were the “A-Team” of trapping. By 11 pm that night, with all the precision of a swat team, Bonnie and I had set up traps and were sitting in our car a few hundred feet away. But we were not successful that night. At 6 am the next morning, we were back and able to trap the three kittens plus a fourth kitten and their Mama cat! We did not even know a Mama cat existed until that morning. Next stop…health care. Bonnie arranged for Hill Country Veterinary to perform the spay/neuter and necessary health treatments. PAWS picked up the tab. Their vet declared the kits were in great shape. Next, I called Pedernales Veterinary to see if they knew anyone who wanted barn cats. Sure enough, they did. One of the great things about Fredericksburg help is just a friend-call away. A Dr. and wife volunteered to take two kittens for their ranch. But as the case with kittens, when she saw the four kittens together and how cute they were, she took all 4! The mama cat had been living on her own along the alleys of downtown Fredericksburg, and she was too feral to be a pet. I took the Mamma to be a barn cat on our river property where she could have a much safer, better life than MarketPlatz. I’m happy to report; Mamma is doing well and adapting to her new home. She usually greets us with a friendly meow when we arrive and is always there when it’s time to eat. 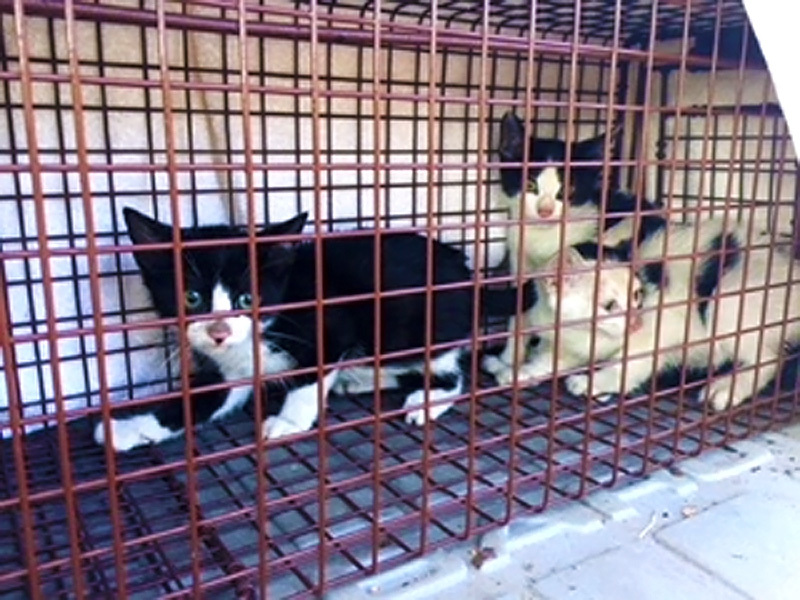 A happy ending for five cats, thanks to Bonnie’s trapping expertise and PAWS. My name’s Peggy, and I’m a PAWS Supporter.